Tuesday, the career of one of the most entertaining Riders came to an end. Over the past 9 years, Scott Schultz’s on field intensity and off-field hilarity endeared him to both his teammates and the fans and etched his place among the franchise’s best. 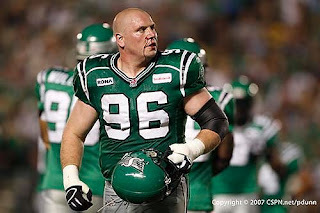 In honour of Schultz’s illustrious career in Green and White, I present to you a look at #96’s most memorable moments on and off the field. 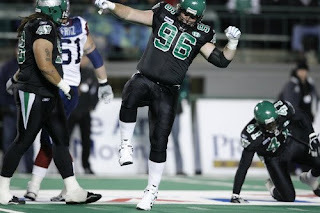 The Riders aren’t exactly known for their success in the 1st round of the Canadian Draft. This franchise has used their precious 1st round selections on such future all-stars as Curtis Galick, Ducarmel Augustin and Nathan Hoffart. Schultzy will go down in history as one of the few 1st round picks we actually got right. During the 2003 West semi-final, the Riders were eager to make the Bombers pay for Troy Westwood calling us a bunch of banjo picking inbreds. Early in the game Schultz and Nate Davis sacked Khari Jones and proceeded to pick their air banjos in celebration. Just before the refs stopped the Thunder Bowl game due to lightning, another classic Schultz moment took place. Sean Fleming was attempting to punt the ball but he mishandled it, and Schultz ended up scooping up the ball. In the ensuing celebration he ran a few steps and hoofed the ball himself. Schultz was always one to speak his mind, which made him a favourite among the both the media and the fans. One of his most famous quotes came in 2003 when he referred to the BC O-line as “Fat Sassy Pigs”. The line is so infamous that Schultzy referenced it at his retirement press conference. 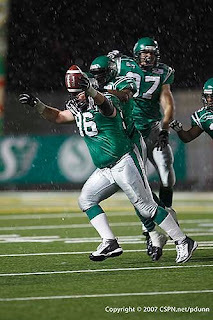 In 2006, the Argos came to town and were in the unfortunate position of putting Spergeon Wynn in at QB. In a play I will never forget, Schultz got loose in the backfield and had an open shot at Wynn. Not one to squander an opportunity, Schultz delivered a vicious hit that nearly decapitated Wynn and sent his helmet flying farther than most of Wynn’s passes went. So long #96, you will be missed. The best top ten ever. You should e-mail him this post at his new job. He would be proud. Ack! I still can't believe it's true. So long, Schultzie! The field won't be the same without ya.